A vibrant Hague School watercolour in excellent condition painted circa 1890 by Fredericus Jacobus van Rossum Du Chattel. 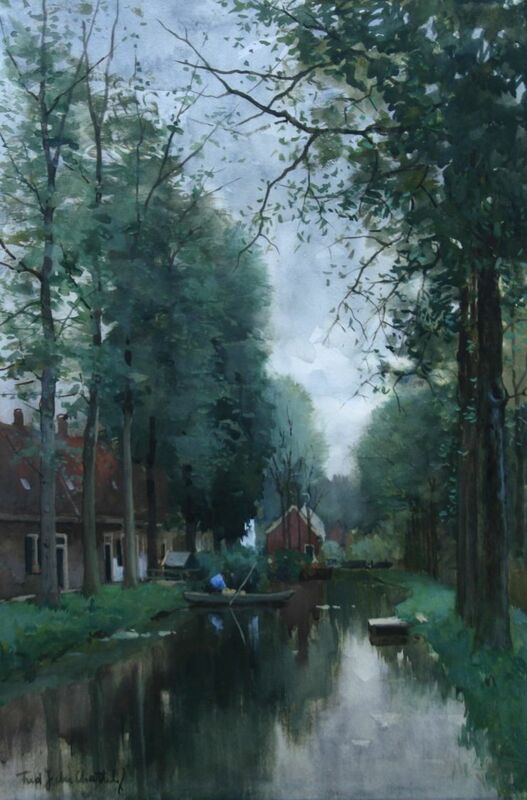 It depicts a Dutch canal. Sublime in its tranquillity, remarkable in its colouring and tonality. Fredericus Jacobus van Rossom Du Chattel (1856-1917) was a painter and watercolourist of landscapes and waterscapes. He studied at the academy in The Hague on a stipend granted him as a 17 year old by King Willem the third. He worked in Munich and Berlin before leaving for the Indies, where he spent two years. He was later decorated with the order of Leopold and the Order of St Michael. He is noted for his watercolours. His work is housed in numerous public collections including Amsterdam Glasgow and The Hague.